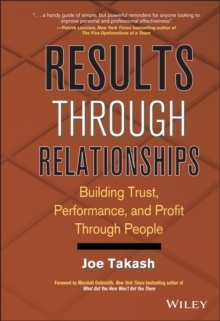 A career guide to more significant business results in a shorter period of time Results Through Relationships shows professionals how to establish break-through relationships with new prospects and their existing networks, including colleagues, bosses, customers, clients, vendors, and others. Many people assume that only new contacts will help them achieve their goals, but in reality, many breakthroughs happen within existing networks. This handy career guide focuses on the bottom-line behaviors that expedite trust, improve workplace performance, and increase profit. Author Joe Takash presents a nine-step process that anyone can master, and his formula proves that we're all in the relationship business first.